Hold the phone, there is new party dress in town and this Black And Gold 1920s Dress knocks the competition out of the park! There is something almost gladiator-like in this Goddess of a flapper dress so we are running with the theme and fighting hard for the best dressed guest prize! Whether you are about to attend a glamourous wedding where you need to tke your style dial up a notch or you are a competing for most awesome outfit at a seasonal party, this scalloped flapper dress is set to see you reigning champion. 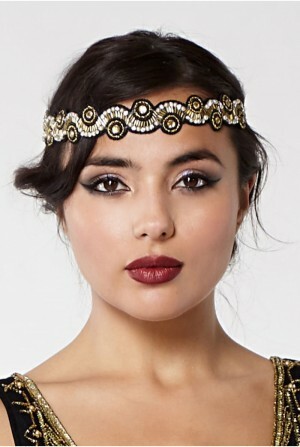 We would team with a beaded headband and a metallic clutch to complete this first prize look. - Where do we start? With those scalloped panels right? Boom. - Drop waist to flatter all matter. 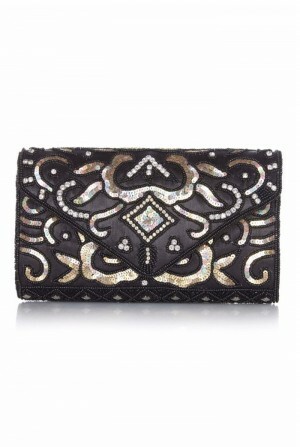 - Gold and black bead and sequin design in oval and linear pattern (tough metallic marvellousness). - V-neckline and wide shoulder straps.